The Médoc wine country encompasses the mythical wine appellations of Margaux, St Julien, Pauillac, St Estéphe and Haut-Médoc, all located on the left bank of Bordeaux. This is a star-studded wine region packed tightly with thousands of famous Châteaux and neat vineyards. The Atlantic Ocean is to the west and the Gironde estuary to the east which both help to create the unique terroir as they affect not only the microclimate but also the soils which characterize each appellation. The grapes used on the left bank make the region’s rich red wines and include Cabernet Sauvignon (which dominates), Merlot, Cabernet Franc and occasional, very targeted Malbec and Petit Verdot. The best examples of Médoc wines are full-bodied, concentrated and extremely elegant. A wine tasting tour of the Médoc is de rigeur for French wine lovers and we have created various one day tours to offer our guests a special introduction to the region’s fine food and wine. We work with an array of wonderful, hand selected wine estates offering not only incredible wines but also friendly and personalized tours, elegant hospitality and a superb wine tourism experience. Here is a sample itinerary for a day out in the Médoc. This morning your private driver will collect you at your hotel or château in or around Bordeaux. Board the plush Mercedes, sit back and relax. Destination: Médoc. This flat region was once a salt marsh and it wasn’t until Dutch engineers arrived in the 1600’s and began to drain the marshes that the region was considered for viticulture. Little by little, aristocrats and tycoons of the day moved in and established large estates with enormous châteaux and vineyards. Thomas Jefferson was key in bringing the wines of the region to the world with his enthusiasm and insistence that the fine wines be bottled so he could take them home. Learn all about the history of the region today while tasting fabulous wines! 10AM Arrive at your first estate of the day such as Château Giscours. Built in the 19th century in honor of Empress Eugenie de Montijo, the winery owns 82 hectares in the prestigious Margaux appellation. The origins of the actual estate date back to the 14th century when it was a fortified dungeon. Wine has been made on the property since the 1550’s and a century later it was being served on France’s sun king Louis XIV’s tables. Your dashing Dutch host has lived in Bordeaux for twenty years and is passionate about his adopted wine region. Tour the estate and learn all about the history of Giscours, taking in the beauty of the surroundings. 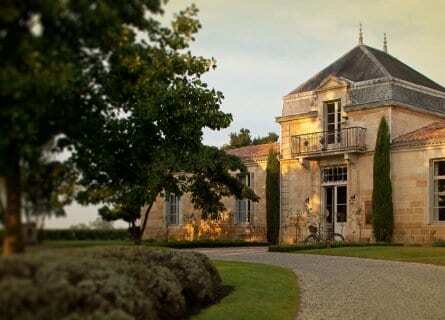 Then continue with your host on a private tour at the nearby Château du Tertre whose owner is the same, which happens to be one of our personal favorites. Tertre has a beautiful small château with perfectly manicured vineyards and delightful architecture. The cellar team is friendly and international and after a tour of the property, finish with a superlative vertical tasting of the wines of Giscours and Tertre. An excellent way to end your morning. 12:30PM At this stage you will be ready to settle into a terrific meal, and we have a very special treat planned- a chef’s taster menu with paired wines at the Two Michelin starred Thierry Marx restaurant at the Cordeillan Bages. Considered to be a cross between the nutty professor and gastronomic Einstein, Marx is at the very least an exceptionally talented chef. Enjoy his food art! 2:30 PM After a very memorable lunch, you have another interesting activity to look forward to: an “Assemblage” private tutorial at the cru classé Château Lagrange winery in the pretty wine country of St Julien. Learn how the winemakers here select the percentage of vinified single varietal wines for their blends, and have fun making your own blend. Finish with a tasting of your blend and of course bottled Lagrange. This is an entertaining way to finish your wine tour of the Médoc. 5:30 PM Your driver will drop you off at your hotel or château in Bordeaux/ St Emilion.